Gingham. I love it. To me it feels homely and evokes comfort, warmth and it just has a laid back honest vibe that makes me happy! Tiny, large, pastel, bright, autumnal - whatever the type, gingham is perfect in my book. Fat Quarter Shop are kindly giving away this stunning bundle of Buffalo Check Carolina Gingham to one of you! That is 15 fat quarters in a beautiful array of colours. 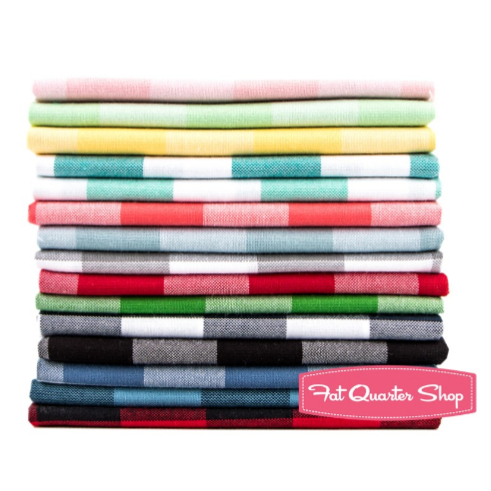 This 1" wide gingham by Robert Kaufman is a brilliant stash staple. 1. Leave a comment, tell me what does gingham bring to mind for you? ⟡ Open internationally, a winner will be chosen on Monday 12th September 2016. When I think of gingham, I think of tablecloths for homestyle meals and picnics. It's a warm, comfy feeling! The first dress I made entirely by myself, with only sewing machine supervision, was a red and white gingham shift dress in 1964! My whole business is centred around gingham. I love it's classic and timeless nature which always reminds me of homeyness. It reminds me of how far we have come and how far we still have to go. I think of my Grandma's "housedresses". I don't think people wear such things anymore. Gingham is so fresh. Have loved it forever! You are so sweet to have these giveaways. My funds are tight and I hope and pray I win one time. My bedroom as a teenager was pink and green gingham. I go right back to high school when I see those checks in pink and green! Thanks for the giveaway! Gingham reminds me of picnic tablecloths and the fun of a picnic! Well, gingham reminds me of some plastic tablecloth at my grand's home. Now I realize it was really ugly, but it was perfect for my child's eyes. Sweet memories. I adore gingham! It reminds me of picnics. Also if it's tiny navy gingham it reminds me of the little outfit each of my babies wore home from the hospital when they were born. I would LOVE these. Gingham reminds me of a lot of things, but these days it makes me think of my friend Jenny's amazing work! Loooove gingham and they remind me of a country picnic!! I love gingham. It reminds me of a country setting--warm, friendly, comfy feeling. Thanks for the giveaway. I think of my home in the 70’s. And my future quilt! Buffalo plaids remind me of university, and the preppy school I attended. Good memories. Reminds me of gingham aprons. Warm and homey. Gingham especially red reminds me of lazy days camping and enjoying fun times with friends. Gingham reminds me of years ago when my mom did smocking with it. Gingham reminds me of Dorothy from the Wizard of Oz and her little dog Toto. I loved the movie and wanted to be Dorothy for Halloween, but it never worked out that I could get the costume together! Gingham reminds me of Summer...and lil dresses for my Daughter when she was little! Gingham reminds me of the tablecloth my mom used when we had dinner outside in the summer. Gingham makes me think of school summer uniform dresses and picnic blankets! Love this bundle, thanks for the chance to win it! Homestyle tablecloths! Thanks for the giveaway! I shared on Instagram, @notqnot . I love gingham. I made an Easter dress out of the large check when I was in junior high school. Always been a favorite. I love gingham. It makes me think of picnics! And twirly skirts. It reminds me of Lori Holt's cute makes! We live in a log home so gingham just feels right at home with us. Sharing on ig. I'm Rexeroll on ig. Love Gingham. Firstly it reminds me of school dresses and then a Bistro Restaurant we went to occasionally that had red and white gingham tablecloths. All good memories. I would say Picnics but I made a baby quilt that I cross stitched Noan's Arc across the checks. The quilt took forever but I loved it. Gingham always makes me think of my childhood. At one point, as a little girl, my room was green and yellow gingham. My favorite green gingham blanket even came with me to college. That blanket was incredibly soft and my first born son discovered it as well. He used it until it was in shreds. Such great memories and all that just from seeing gingham!! Thanks for the chance of the giveaway. Gingham reminds me of childhood picnics with a gingham tablecloth spread out on the grass. Gingham...that is happiness all over, remembering grandmother, some sewing and picnics... Oh pure happiness. So much to love about this fabric! Gingham reminds me of school summer dresses, cafe table cloths and for some reason Doris Day! What a lovely giveaway. It always reminds me of table cloth at home but I would love to use them for cloth making now. Gingham has a real 60's vibe in my book! We had school uniforms and sun hats made from it when I was a little girl. And also I participated in a Gingham Blog Hop back in 2012, where I made a gingham table runner. I am admiring it while I type this! Thanks for the giveaway! I'd love to win it! Gingham reminds me of my 1960's netball tunic,red and white check, very happy days! For me it's school summer dresses. Mine were pink and white. I did the nursery for my first baby in gingham. 38 years ago. It was adorable. Gingham reminds me of a country kitchen!! Gingham reminds me of picnics. I think a great picnic blanket is made up of gingham. These are beautiful. Picnics and little girls dresses! It brings memories of curtains for the kitchen!! like most people gingham reminds me of childhood and summer dresses. I still love to back quilts with gingham. Gingham dresses my Mom made me, l loved them. And therefore made my girls, granddaughters and one great granddaughters! Making a dress for my daughter-so many years ago! I am working on a shirt in grey gingham jersey, it has always been a favorite fabric. I hope one day to find a way to use it in a quilt! I shared on Facebook! What a wonderful giveaway! It reminds me of flannel shirts that my husband used to wear when we lived in a colder country! Gingham reminds me of cozy flannel shirts and the upcoming fall season. I think of my mom and growing up in the 50's...love it! Picnics of course, but also little girl dresses! I love the big buffalo check as an alternative to tiny gingham. Ah, gingham makes me think of aprons, tablecloths, restaurant curtains and napkins. So...mostly kitchen related. They definitely give me a 'warm and cosy' feeling too. I love how they combine with prints and solids. They are so very forgiving and bring a lot of charm to a project. Thank you so much for the chance to win. gingham reminds me of when i was a kid, my mom made all our clothes and we always had lots of gingham. Gingham and polka dots....both produce happy thoughts. What a lovely giveaway. Gingham brings to mind old movies with square dancing. Gingham reminds me that Fall is right around the corner! Nothing like a warm flannel shirt! i love gingham - it's so classic, brings back great memories! My mom's pink gingham apron with cross stitch designs! 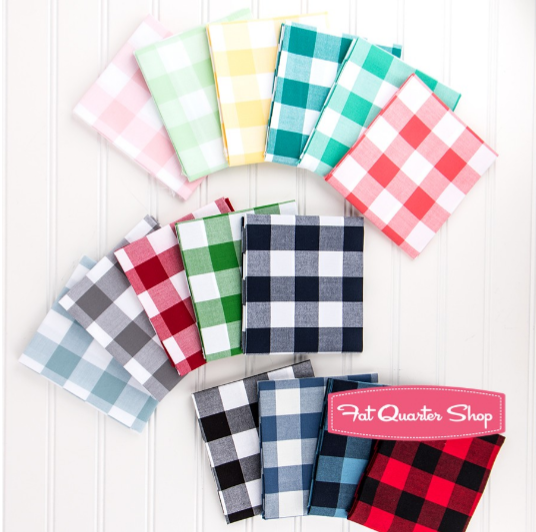 Make me think of a cozy fireplace wrapped up in a gingham handmade quilt sipping a toasty hot chocolate and then I wake up to find I won some lovely gingham squares so I can concoct one of my own. Gingham brings our warm country kitchen to mind. Thanks! Gingham reminds me of my mother, who made me a sky-blue gingham dress to wear to a dance in the 6th grade. I shared this giveaway on Twitter, where I am @wordygirl11. Gingham reeminds me of my grandma and the pleated skirts she used to wear (and did sew for me. I hatet them.... but loved my grandma). Gingham reminds me of my Grandmother's kitchen. There wasn't a better place to be! Thank you for the giveaway! It reminds me of summer curtains that my 2nd mom had in the kitchen windows. When I see gingham I remember gingham curtains with the sunlight streaming through them in the summer, so the window is open. The curtains are moving with the gentle breeze. Gingham reminds me of table cloths and ruffled curtains under the kitchen counter to hide the shelves and their contents. Gingham brings to mind cute girl's dresses with smocking and dinners at an Italian restaurant that had gingham napkins! Gingham reminds me of my childhood and in particular a favorite dress my mother made me - black and white gingham with a red ribbon trim. Gingham always reinds me of my Nan's tablecloth on her small kitchen table, and her letting me help her make cakes! Thanks for the giveaway. First: cutting wood in the fall for the warm colors. Second: canning in a clean summer kitchen for the bright colors. Gingham makes me think of dish towels, little girl's dresses, and curtains. Gingham makes me think of picnics. The very first thing I made in home economics, grade 6 was a pink gingham apron! We made it a gathered. And it tied at the waste and then did some x stitches on the pocket before we sewed it on! That was a long long long time ago! Gingham always reminds me of summery shirts, picnics and sunshine. Gingham is so classic country. Gingham reminds me of Dorothy from The Wizard of Oz, and Little Debbie cakes, (Yum!). During the summer months I have light blue gingham curtains at my kitchen window, that I made several years ago. 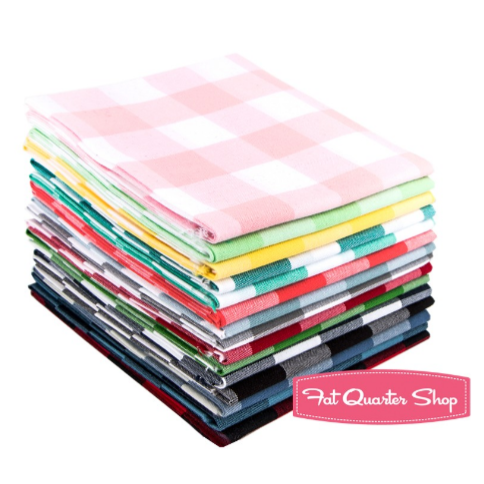 I would love to make something new with those large scale gingham fat quarters, thanks for the chance! I remember the curtains I made for my first son's room when he was an infant--blue gingham! Love this bundle! Gingham takes be back to childhood because I had a couple of gingham dresses. I love gingham. It give me a homey feeling thinking of bbq and picnics and flannel shirts and blankets. Yes gingham and a comfy staple. Gingham remind me of a lovely picnic on a sunny day. Gingham reminds me of old fashioned dresses for little girls,complete with smocking. What a gorgeous giveaway Gingham makes me think of summer picnics and summer school dresses- I had a blue one I think. Gingham always reminds me of my school uniform summer dresses. That was many years ago now! Gingham is fresh. Happy. Simple. It looks so sweet on a child, but just at home on a grown man too. I love gingham. I absolutely love classic ginghams and stripes. Gingham reminds me of my childhood tap dancing days when mum often made me gingham costumes in preference to the glittery ones that most others wore. oh gingham is aprons and dresses and towels on the line... big open green spaces and farms! I grew up in the midwest of the US so to me it kind of feels like home, since it makes me think of farmland! My sister's wedding. She had a picnic styled lunch with gingham table cloths and little bows on the Pimms stirrers. Was gorgeous! My first project for Needlework, as it was called then(! ), was to make a sewing project case. Mine was made out of a pinky/red gingham and decorated with hand embroidery. I still treasure it. It puts me in mind of farmhouses and clean kitchens. I had a gingham swimsuit that I made. I remember the smells of the lake and swimming pools. I think of my sisters and brothers and the fun we had. My sister had a lilac gingham dress. She looked so pretty in it. I love gingham fabric. It takes me back to my childhood when my mama would make matching dresses for my sister and me. My mama has been gone for 20 years this Christmas and I miss her every day. We would be ever so lucky if we all could have a mama like mine! Gingham always makes me think of Gramma's kitchen curtains and 1/2 aprons. Love it! I remember growing up with gingham. In kindergarten, I had a deep green gingham dress, I had later had a black and brown blouse with embroidery and for my Christmas concerts in high school my mom sewed me a long dress in green gingham. I love gingham because I grew up with it and because it reminds me of my mom. I really LOVE gingham, any size, any color! It brings back memories of Grandma's aprons, picnic cloths, and patchwork table cloths. I am so glad to see it returning in fabric, i.e. Lori Holt's vintage quilts and accessories. Gingham is so classic country try and reminds me of country kitchens and picnics. Gingham reminds me of lumberjacks! shared on my timeline at facebook! Gingham always makes me think of picnics and happy feelings :) reminds me of picnic blankets! Gingham makes me think of picnic blankets. I do so love gingham fabric - I remember my mum sewing two yellow gingham dresses for me when I was very small, they were my favourite dresses! My email is walkthedust@gmail.com thank you!!! Gingham: Spring time, picnics and my favourite dresses.